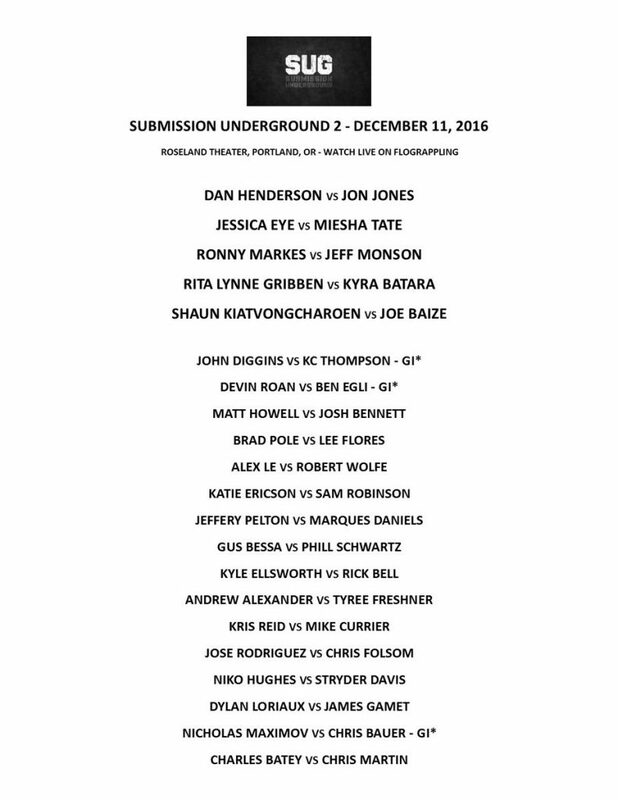 Chael Sonnen’s Submission Underground 2 streams LIVE on FloGrappling.com on Sunday, Dec. 11, at 5:30 p.m. ET. A submission-only grappling event, SUG 2 brings the world’s best grapplers and mixed martial artists together to determine the best submission fighters in the world. There are no ties and no draws. One person wins and one person loses every matchup. In the main event, former UFC light heavyweight champion Jon Jones faced legend Dan Henderson in a submission-only grappling match. Jones won roughly seven minutes into the contest via arm triangle. Former UFC women’s bantamweight champion Miesha Tate grappled Jessica Eye in the co-main event. The two fought in a mixed martial arts competition under the UFC banner in 2015 with Tate winning a unanimous decision. There was some confusion as Tate had Eye in an armbar and the contest appeared to be over but Eye said she didn’t tap and the referee restarted the contest on the feet. •ON TV: Now available on Roku and Apple TV 4 — download the FloSports app today. NOTE: Annual subscribers on any FloSports site get access to SUG 2, as well as to premium content across every site in the network.